For the first time, Modi has been quoted in any book talking about the hitherto untouched aspects of his life. The book is based on extensive interviews of the Prime Minister, when he was the Chief Minister of Gujarat, and his close relatives about the influences that shaped his thoughts and actions. The 400-plus pages talk about the inspiring stories that made Modi what he is today—how he evolved as a man of development and empowered people with his decisions, and how he faced the poison-laced barbs of his critics who were ready to tear him to pieces for a crime he never committed. This book tries to separate the gold from the chaff. This may help to bust the cultivated myths being spread against him. Modi's journey from a tea seller to the Prime Minister has been one of struggle, dedication, determination, hard work and perseverance. An average Indian finds his own reflection in the struggle of Modi. A victim of child marriage, a usual practice in the backward Ghanchi caste, his desire to serve larger causes persuaded him to skip the final stage of the three-stage Gujarati marriage. When leaving home as a wanderer in search of truth, he took a formal leave of everyone. Coming from a poor family, he tried to design solutions to poverty. As chief minister he empowered farmers by making agriculture lucrative. He made industries attractive by linking them with profitability, employment and development. Muslims and Modi are drawing close to each other. The community voted overwhelmingly for the BJP in both Assembly and Lok Sabha elections. 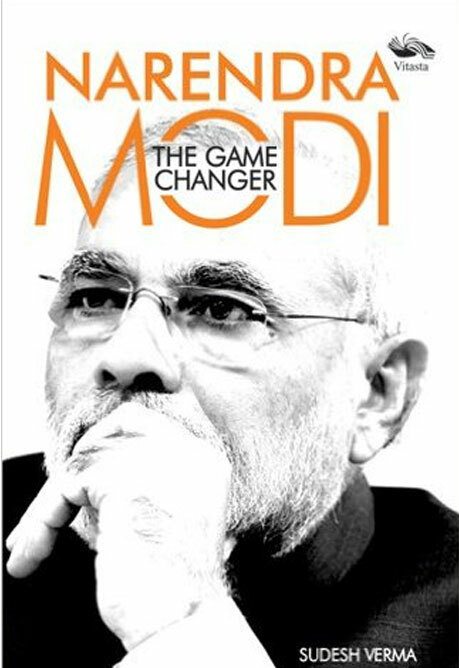 The book presents Narendra Modi as a GameChanger who knows how to impress people with his work. Now that he is the Prime Minister he is expected to continue his game changing actions that will bring confidence to the nation seeking a new identity in the world order. Covering events up to Narendra Modi’s Independence Day speech on 15 August 2014, Verma talks about the likely turn the country may take under his leadership. Sudesh Verma is a senior journalist. His last assignment was as News Editor, News X. In a career spanning more than two decades, he worked for, among others, The Statesman, Deccan Chronicle, The Business Standard and India News Television Channel. His stint as Senior Political Analyst in the British High commission for over three years taught him lessons in bureaucracy but he realized his existence there was in stark contrast to the world outside and one fine morning he decided to quit and do something more meaningful. Influenced by the ideal of becoming a factor for change, he became a socio-political activist and led Youth 4 Democracy movement for change. After intense research on Narendra Modi vis a vis other political leaders, the author concludes that Modi is the country's best bet for deliverance. Having known him ever since he was a Delhi-based secretary of the BJP, the author attempts to present the real Modi. Verma, who is an M.Phil in International Studies from the Jawaharlal Nehru University, has contributed chapters to various books including The Other Side: Redefining Bharat, and Prime Ministers of India. He also regularly writes on socio-political issues. The book is a product of in-depth research of one year by a dedicated team that sifted through more than 50,000 hyperlinks, a dozen books on Modi including the ones in Gujarati language and various research papers. The author and his team interviewed more than 100 people, mostly those impacted by the initiatives undertaken by Modi when he was the chief minister of Gujarat.